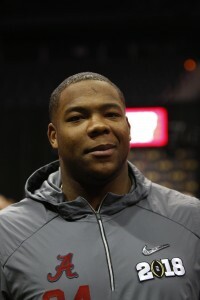 The Falcons were interested in trading up during Round 1 for Alabama defensive tackle Da’Ron Payne, per Tony Pauline of DraftAnalyst.com. However, the Redskins taking him at No. 13 made the Falcons change their plan. They stood pat and drafted Payne Crimson Tide teammate Calvin Ridley, doing so despite having Julio Jones and Mohamed Sanu in the fold. Pauline notes the Falcons passed on Florida defensive tackle Taven Bryan — the Jaguars’ pick at No. 29 — because they weren’t particularly enamored with the former Gator’s game. Atlanta has Grady Jarrett and Jack Crawford stationed in the middle of its defensive front, and the team used a third-round pick to help out at this spot in taking South Florida interior defender Deadrin Senat. C.J. Anderson‘s Panthers deal will be worth around $1.7MM this season, with Joe Person of the Charlotte Observer adding that $800K in incentives are available to the longtime Broncos starter. This comes after the Broncos released Anderson well over a month into free agency. The 27-year-old running back would have made $4.5MM in 2018 on his previous contract, one the Dolphins originally designed and one the Broncos shed free of any dead-money charges. While it’s only rookie minicamp, the Falcons had former LSU wide receiver Russell Gage playing cornerback on Day 1, Vaughn McClure of ESPN.com tweets. Gage played wide receiver during his final two years at LSU but as a sophomore worked exclusively at cornerback. He did so as a freshman as well but didn’t see much action playing defense in college. He managed to be a sixth-round wide receiver pick despite finishing his college career with just 28 receptions, so the Falcons — who traded up to get Gage — may have a firm plan for the rookie. Sharrod Neasman saw action in 14 games for the Falcons from 2016-17, but he’s working out with the Saints during their rookie camp this weekend, Tom Pelissero of NFL.com tweets. A 26-year-old safety and a former UDFA, Neasman drew interest from the Saints in the past. Pelissero notes New Orleans tried to sign him off Atlanta’s practice squad. Neasman worked out for the Chiefs recently as well. The Redskins have signed first-round pick Da’Ron Payne, according to Field Yates of ESPN.com (on Twitter). The defensive tackle has become the first Round 1 pick from the 2018 NFL Draft to ink his rookie deal. Payne, an Alabama product, vaulted up the draft boards this year thanks to his run-stuffing ability. The Redskins pounced on him at No. 13 overall with the belief that he can also develop into a strong defender on passing downs. Last year, Payne had 53 total tackles, a sack, and an interception as Alabama captured yet another National Championship. Payne projects to be the Redskins’ starting nose tackle this year with defensive ends Matthew Ioannidis and Jonathan Allen on either side of him. Between Payne, Allen, and outside linebacker Ryan Kerrigan, the Redskins’ starting front seven boasts three former first-round picks. Good news for Wisconsin product Nick Nelson. The surgery to fix the cornerback’s torn meniscus was successful and he did not need a full repair, Ian Rapoport of NFL.com tweets. Because it was not a full repair, he is expected to recover in six weeks rather than 3-4 months and should be ready for training camp. Nelson was projected to come off the board no later than the third round before the injury and he should be in consideration for rounds 2 and 3 once again after the operation. The 49ers met with Georgia linebacker Roquan Smith on Tuesday, according to Matt Maiocco of NBC Sports Bay Area. Smith had 137 tackles and 6.5 sacks last season and could be a replacement for Reuben Foster, who is embroiled in serious legal trouble stemming from a domestic violence arrest. Iowa center James Daniels, who is widely regarded as the top center in this year’s draft, visited with the Eagles this week, Ian Rapoport of NFL.com tweets. On Tuesday, he’ll meet with Bears before traveling to the 49ers on Wednesday. Daniel Jeremiah of NFL.com says that Daniels is one of the best center prospects he’s seen in the last five years and has him ranked as the 23rd best prospect overall in this year’s draft. South Carolina tight end Hayden Hurst, met with the Lions on Tuesday, Rapoport tweets. If the Lions select Hurst in the first round, that will make three first round tight ends for them in the last ten years, following Brandon Pettigrew (2009) and Eric Ebron (2014). Louisville cornerback Jaire Alexander visited the Eagles and Dolphins this week, Rapoport tweets. Alexander is widely projected to be a first round pick and may be the second CB to come off the board after Ohio State’s Denzel Ward. 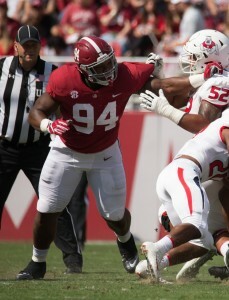 Teams like Alabama defensive tackle Da’Ron Payne, but the belief that he is a two-down defender and not an adept pass-rusher may keep him out of the Top 10, Tony Pauline of DraftAnalyst.com hears. Speaking of Payne, he visited the Redskins on Monday, a source tells ESPN.com’s John Keim (on Twitter). Washington owns the No. 13 overall pick in the draft. Jordan Raanan of ESPN.com believes there is a “decent” chance that the Giants trade down from their No. 2 overall selection, and if they do, he believes Notre Dame guard Quenton Nelson would be the target. Nelson is widely-regarded as the safest bet in the draft. Because there is so much QB talent in the draft, as many as six signal-callers could be taken before New England’s No. 23 overall pick rolls around. As Mike Reiss of ESPN.com observes, that could allow the Patriots to land the type of player it rarely gets the chance to select, as they are typically picking at the end of the first round. Reiss suggests that Alabama linebacker Rashaan Evans could be the team’s target, as he would provide much-needed speed at the LB position. Alabama DT Da’Ron Payne, an excellent run-stuffer who has the skills to become a quality pass-rusher as well, will meet with the Bengals tomorrow, per Ian Rapoport of NFL.com (via Twitter). Ryan O’Halloran of the Florida Times-Union thinks the Jaguars need another TE who can threaten the middle of the field to take attention off their outside receivers, and he believes Oklahoma’s Mark Andrews would be a good fit for Jacksonville’s No. 29 overall selection. Florida DT Taven Bryan has been generating a lot of buzz lately, per Matt Miller of Bleacher Report, who tweets that the Gator could be a top-25 pick. Miller suggests the Falcons, who are working out another DT in N.C. State’s B.J. Hill, could be a fit. Miller tweets that three offensive tackles are considered locks for Round 1: Texas’ Connor Williams, Notre Dame’s Mike McGlinchey, and UCLA’s Kolton Miller. UCF’s Mike Hughes has a great deal of upside and is the No. 15 overall prospect in Daniel Jermiah’s most recent Top 50 rankings. However, Miller believes that, because of Hughes’ off-field concerns, he could be the fourth or fifth CB off the board (Twitter link). There are four linebackers expected to be taken in the first round, per Miller (via Twitter): Evans, Virginia Tech’s Tremaine Edmunds, Boise State’s Leighton Vander Esch, and Georgia’s Roquan Smith. Miller says Edmunds’ stock is rising rapidly and that he should be a top-10 selection. Minkah Fitzpatrick isn’t the only Alabama underclassman going pro. Defensive tackle Da’Ron Payne and safety Ronnie Harrison announced this week that they will also skip their senior seasons in order to enter the 2018 NFL Draft. Payne is leaving on the highest note possible after being named the defensive MVP of the Sugar Bowl and the National Championship game. His raw physical skills should vault him into the first round in April. Harrison recently received a second-round grade from the NFL’s College Advisory Committee. That’s no surprise after he racked up three interceptions and was named first-team AP All-SEC in 2017. Harrison also led Alabama with 74 tackles on the season. Running back Bo Scarbrough is also entering the draft, but where he goes is anyone’s guess. Scarbrough split carries with Josh Jacobs and Najee Harris this past season, leaving him with a smaller share of the workload than anticipated. With solid workouts and some big games in his past (like 2016’s 180-yard showing against Washington), Scarbrough is hoping to put himself in the late-round conversation.